The minimum goal of $850,000 and deadline of May 15, 2018 have been REMOVED from this Pre-Sale due to new fundraising developments. Anyone that wants a FULL REFUND will be granted on upon request only. Insiders all were made aware of these changes in the March Newsletter. Rewards will be processed for delivery once we have reached our funding goal. 15 Minute Direct Phone Call With The Founders To Hear Your Ideas, Thoughts, & Questions. The vision of iMackulate Vision Gaming is to become a Global industry leader in the realm of interactive entertainment content through a strong commitment to innovation, organic connection to the target market and the constant pursuit of greatness. As an Insider, you will have the opportunity to submit your ideas for one of our generic teams that will be featured in the game. We give this opportunity to our insiders almost every other month through the monthly newsletters that they receive. After receiving submissions, we choose the best ideas and the let the community decide the four best generic team ideas through weekly twitter polls. Ultimately, we are left with the final four teams that all will make it into Gridiron Champions and have an official logo created as your pictured. This is a really fun opportunity that we would like all of our Insider's to take advantage of. 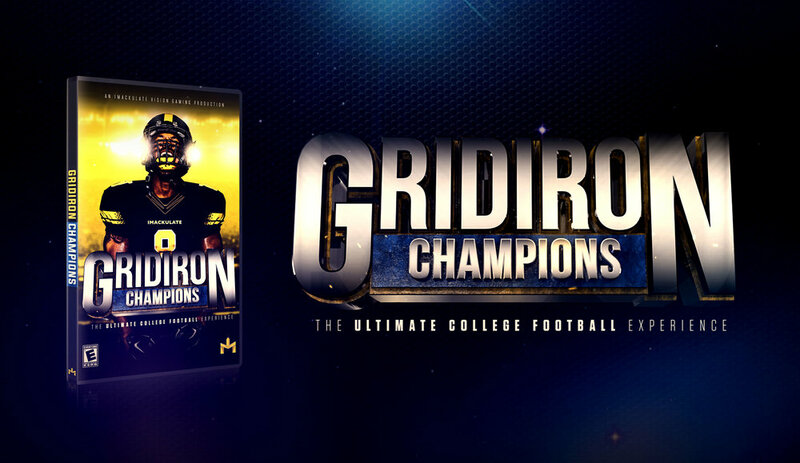 Will you take advantage of your opportunity to leave an imprint on Gridiron Champions? Current Insider Teams Include: The University Of Delaware, Autumn Bay Ninjas, Canyon University Pit Vipers, Alabama Christian University Rampage, South Jersey University Demons, Orange Beach University Titans, Chattahoochee State University Bears, Texas Gulf Coast University Falcons, The University Of Central Colorado Cougars, Nevada Southern Yellow Jackets, Mississippi A&M University, Detroit Tech University Bulldogs, Georgia Central University Venom, Oklahoma Tech University Cyclones and The University Of Lower Alabama Knights.